A few weeks ago, Dave surprised me at work and took me on a date. 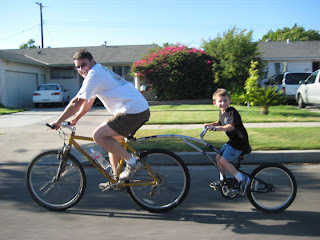 Lance watched the kids, and as Dave and I were driving down their street this is what we saw. I just thought it was so cute I snapped a few pictures. We were driving parallel so that's why the pictures are not that clear. And yes I know that Caiden doesn't have a helmet. 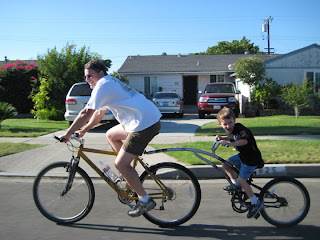 They just rode down the street, and we have since provided Lance a helmet that fits Caiden when they ride this bike. We are definitely doing that with dean when he gets old enough. that looks like lots of fun.